This post is a little late, but I wanted to get it out there so people know what vegans (0r anyone else for that matter) may choose to eat instead of participating in the yearly turkey massacre on Thanksgiving. Below are the dishes I shared with some awesome vegan friends and my omni husband this year. Many of my dishes were from Nava Atlas’ new book, Vegan Holiday Kitchen. I love it! 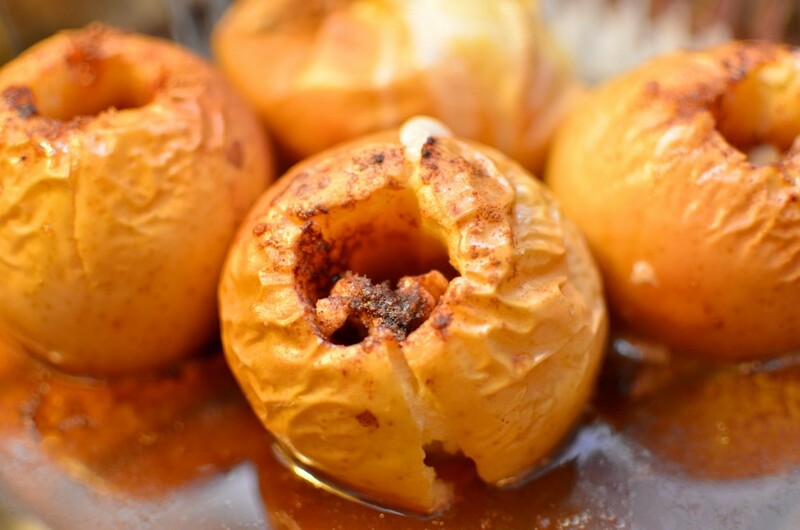 It provides many festive recipes for Thanksgiving, Christmas and the holiday season, Jewish holidays (Passover, Rosh Hashanah, and Hanukkah), Easter, Independence Day and summer entertaining, brunches, appetizers, and potluck dishes. 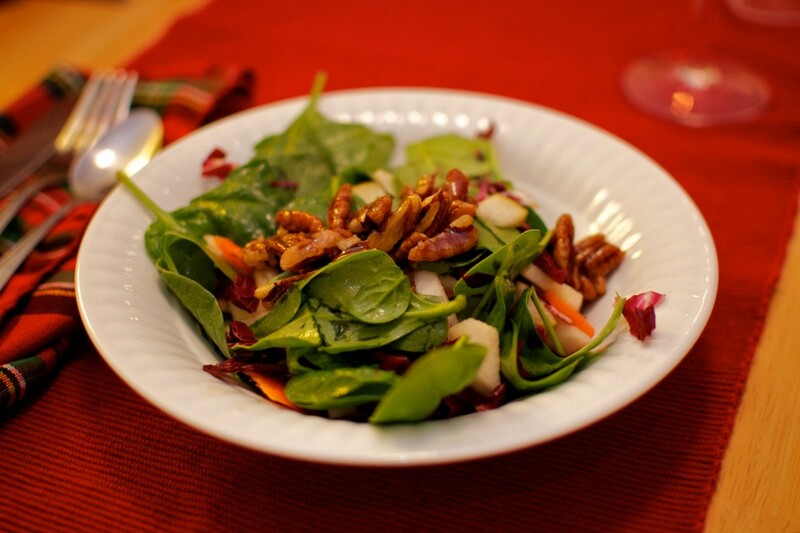 We started off the feast with a mixed baby greens salad with pears and glazed pecans. 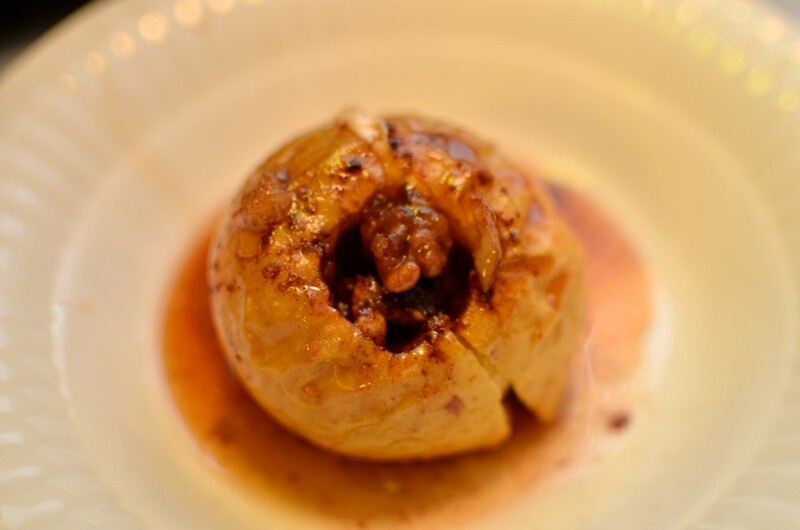 The pecans were still warm when I served the salad, which was very inviting and delightful for myself and my guests. It was the right blend of savory and sweet. 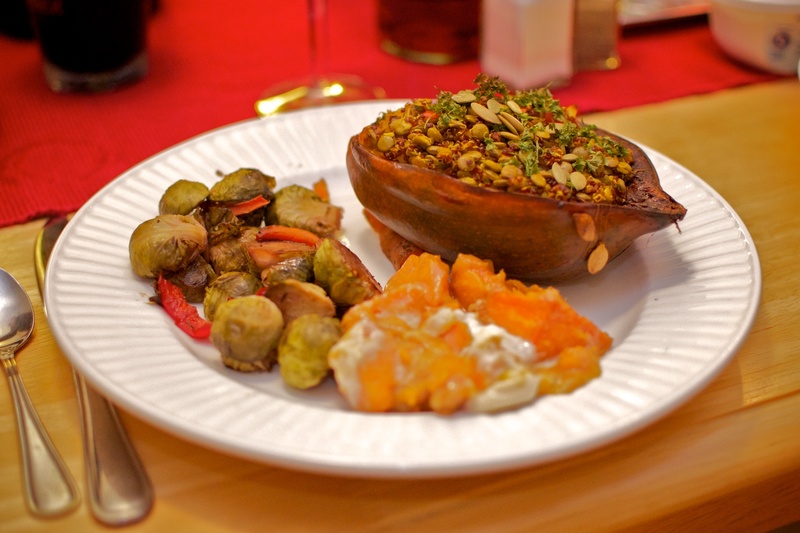 The main entree consisted of quinoa and lentil-stuffed golden acorn squashes. 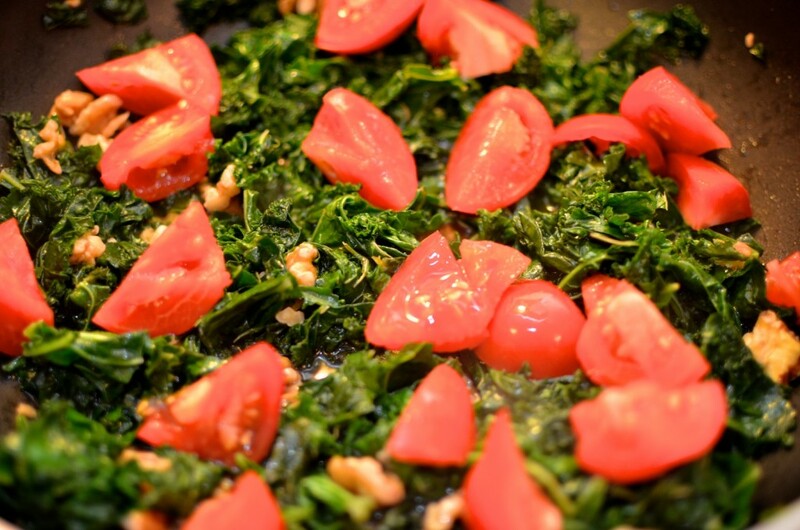 I used red quinoa in this recipe and topped them off with parsley. 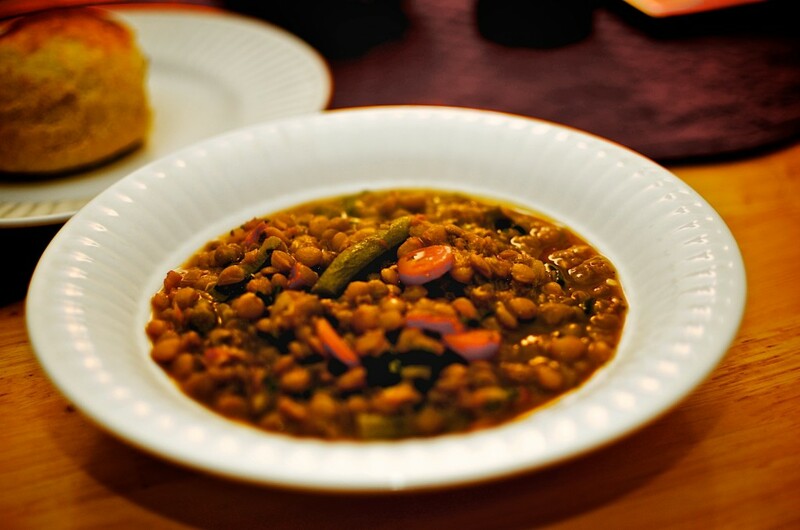 Red quinoa isn’t only colorful, but tastes delicious and along with the green lentils in this dish, made for a very hearty meal. 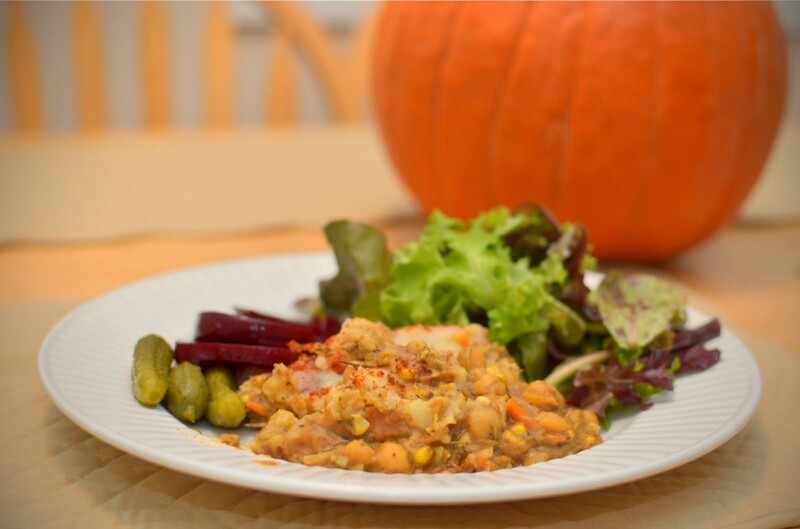 Quinoa and lentils are protein-packed and really give this fall meal the backbones that many believe might be lacking in a vegan Thanksgiving feast. 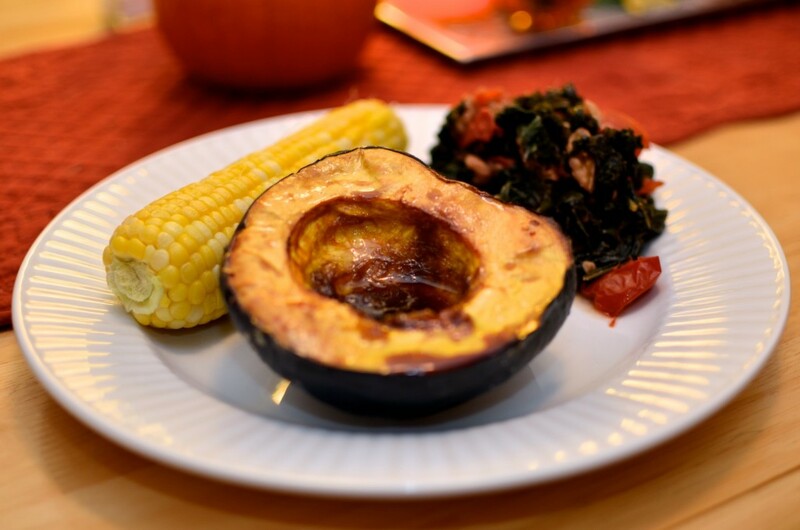 No worries here: just one half of a stuffed squash is enough to fill up most guests. The squash were accompanied by red wine-roasted brussels sprouts (from Vegan Holiday Kitchen) and this candied sweet potatoes dish. I added some Dandies marshmallows to the sweet potato dish when I baked them which was pure perfection. The brussels sprouts were tasty but could have been cooked at little longer or seemed to be missing something. 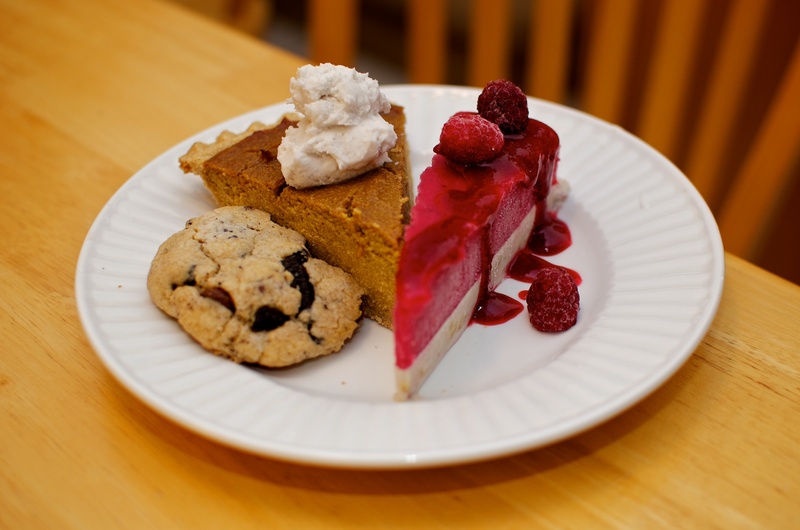 No Thanksgiving meal is complete without delectable desserts. 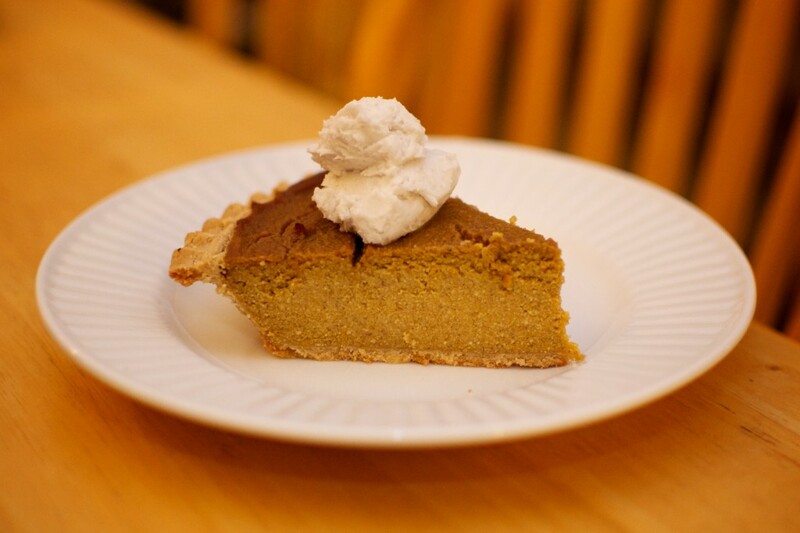 I used my favorite pumpkin pie recipe for the pie we enjoyed this year. I could eat this pie for breakfast, lunch, and dinner. I used a coconut-based cream for the topping that I made from a previous recipe I was testing out for Kelly Peloza’s new cookbook coming out in the future. 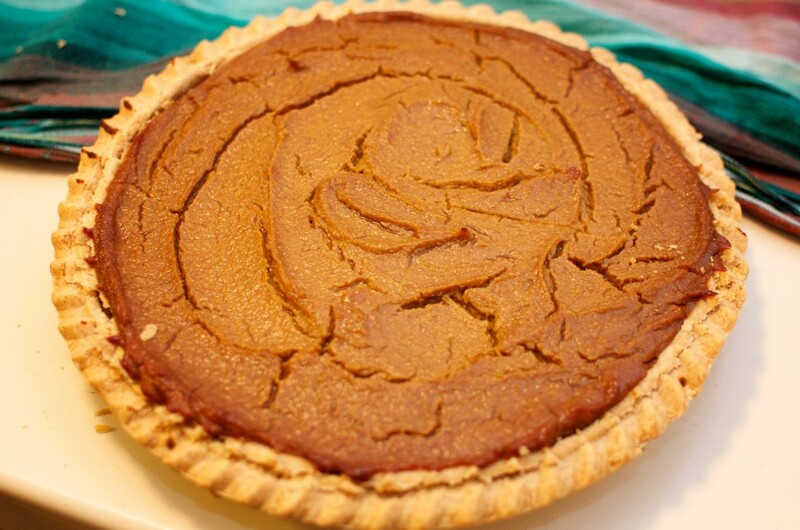 It made a lovely addition to the pie. It helps to have awesome vegan chefs as friends who love to bring you their creations. 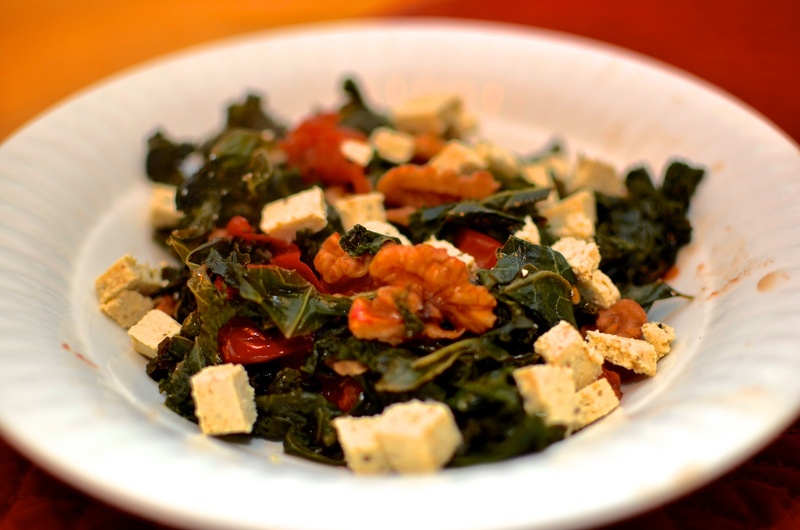 My friend Anastasia St. John delighted us with a family recipe she veganized. 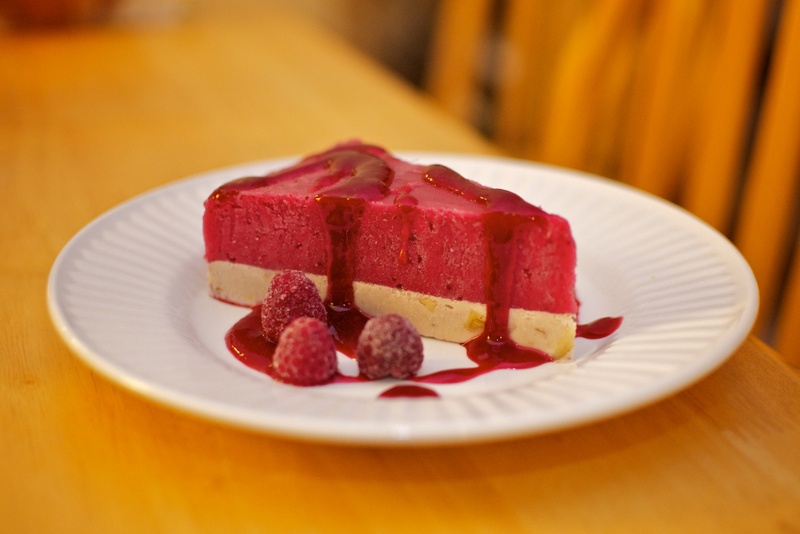 It was a frozen cranberry pie made blended with pineapples, topped with a raspberry glaze, on a cashew cream and walnut crust. Simply divine! Another talented vegan chef and friend, Stephanie Langer brought over some amazing cookies. The cookies consisted of cookies within a cookie (hence the clever name, “Cookie Cookies”). 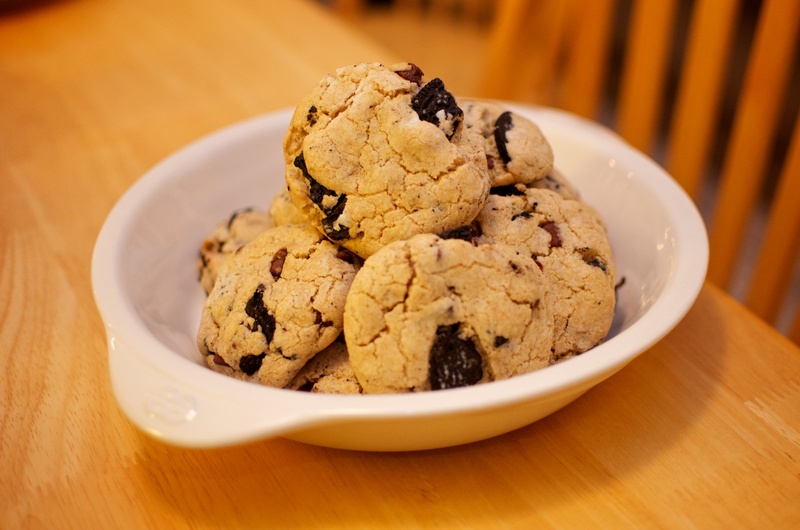 The cookies contained broken Oreos (or in this case, Newman O’s Original) inside a more traditional sugar cookie-type recipe. The recipe can be found in The Complete Guide to Vegan Food Substitutions on page 92 by Celine Steen and Joni Marie Newman. Amazing! I naturally could not help myself and had to sample all three desserts we had on hand that evening. It was a happy plate of goodness. Overall, I give this decadent meal a 4 1/2 out of 5 carrots on the veganlicious scale. One of the great things about following hundreds of other VeganMofo’ers is the creativity and variety of recipes you stumble upon. For the first Vegan Iron Chef Challenge, the secret ingredient was chickpeas. 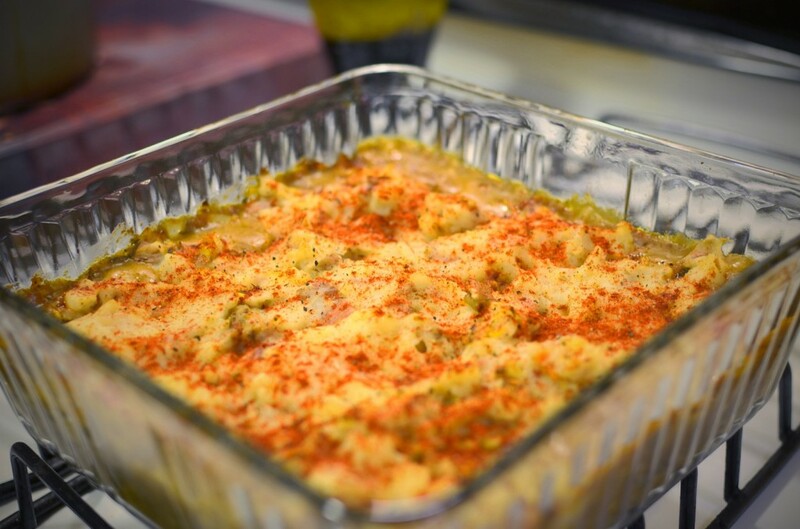 I ran across this divine recipe at the Unhealthy Vegan’s blog for a chickpea-based shepherd’s pie. Oh my! 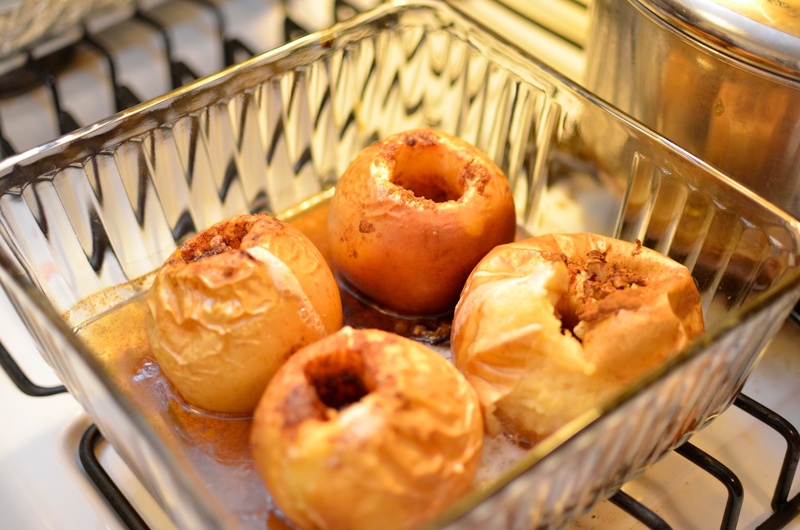 It had complex flavors and textures and made a hearty fall or winter meal. We served it with baby dill pickles (as per the blogger’s recommendation! ), pickled beets, and a mixed green salad. Excellent! 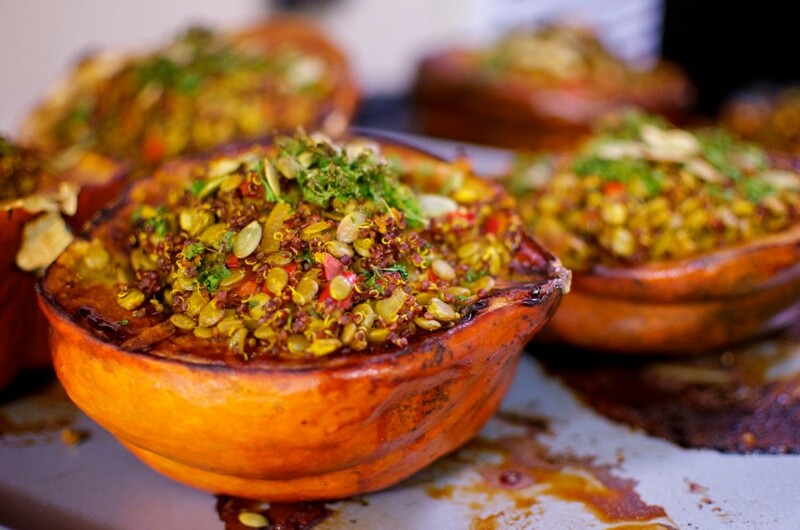 Overall, we give this dish a strong 4 out of 5 carrots on the veganlicious scale!